‘Once upon a time, far, far away and long, long ago,’ Kate Forsyth opened a wonderfully thought-provoking panel on ‘The Unexplained’ at the Historical Novel Society 2014 Conference in London this weekend. The conference included Conn Iggulden’s very funny and inspiring keynote presentation on filling in the gaps in histories, a thoughtful panel on the big issues of Freedom, Independence and Equality in the historical novel, and an hilarious panel entitled ‘My Era is Better Than Yours’ where Vikings’ big axes competed against Tudors’ big women, Romans contended with Medieval courtly love, and the contest was won by a dark horse that came up on the outside: the Georgian Era, championed by Antonia Hodgson, author of The Devil in The Marshalsea. There were workshops on topics such as ‘The Allure of the Outcast’ and ‘Feisty Heroines and Dutiful Wives’, pitching to agents, a panel on the market, social events, a conversation with Lindsey Davis, and a Quiz run by The Historical Fictionist, pitting The Horde: the audience’s collective knowledge of historical fiction, against The Spartans (three steadfast authors). 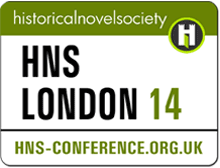 Aspects of the discussions that particularly interested me concerned tensions and synergies between historians and fiction writers, and issues of gender in historical fiction writing, with Kate Forsyth seeing her work as rescuing women such as Dortchen Wild – who inspired and married one of the Grimm Brothers – ‘from the oubliette of history written by men’. David Starkey’s recent dismissive remarks about Philippa Gregory’s novels as chick-lit and ‘Good Mills and Boon’ came up, along with challenges to the seriousness of historical fiction from historians and the academy in general, despite Booker Prize Winners such as A.S. Byatt and Hilary Mantel. Deborah Harkness who is both a History Professor and the author of the All Souls series of novels, brought some useful perspective to the issue, saying that she found herself confronted every day with the limits of history and felt the common ground between history and historical fiction lay in historical empathy.